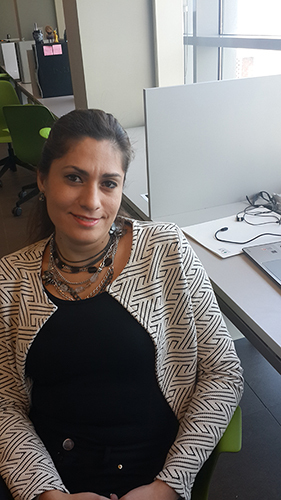 Nadine Hajj is a research associate at the Department of Electrical and Computer Engineering at the American University of Beirut. She obtained her PhD and M.E. in Electrical and Computer Engineering from the American University of Beirut in 2017 and 2013 respectively and her B.E. from the Lebanese University in 2010. From 2011 to 2012 she joined Intel Corporation as a graduate research intern. Her research interests include computational intelligence, deep learning and computational neuroscience. On January 31, she will be conducting a one-day training on Artificial Intelligence. We sat down with her to get to know her better and discover the complex world of Artificial Intelligence with her guidance. Question 1: How did you get interested in Artificial Intelligence? I stumbled on AI during my master's degree. My thesis advisor was doing research in machine learning and she’s the one who put me on track and advised me to go into the field. I’ve been working in AI for the past 8 years. I wanted to be a little bit ahead of the market. Back then, when I got my Bachelor of Engineering, the field of electrical engineering was starting to get saturated and I wanted something that would give me a skill set that I can build a career with. Question 2: What do we need to start using Artificial Intelligence and for what kind of companies is it most crucial? If you want more product, you need to generate data and use this data to see where you can enhance this product. Normally you can collect surveys and customer service experiences but sometimes this research is not enough and you need more insights. By using the AI technology, you can innovate at every level. For example, if you are in retail, you can examine the facial expression of your customers to assess their satisfaction. The more users you examine, the more data you can collect, the better product you can create and this is a continuous cycle of improvement. Every single industry in different market segments has the potential to be transformed by AI. This is something that the Lebanese market did not start to realise. Question 3: How does a beginner get started in Artificial Intelligence? You should start by looking for a problem that you’re trying to solve that could be fit for an AI problem. What is it that you want to do? What is your ultimate goal? For example, If you’re selling a product, you may be interested in discovering new features that your customers would enjoy [by] using AI technology to research this problem. A lot of tasks are being automated using AI technology in sectors such as government and security. For example, if a city has been affected by an earthquake, examining images using an AI algorithm can help determine where first responders need to go. Another example of artificial intelligence applications includes the suggested product feature on Amazon and eBay. Question 4: Can you tell us more about Women in Big Data and your involvement with them? We recently launched the Women in Big Data chapter in Lebanon. We are going to organise events involving big data, analytics, AI. We’ll be bringing in experts to host talks, workshops and tutorials. These events are targeted to experts but also beginner.s. The goal is to promote these fields and encourage more women to go into STEM (Science, technology, engineering, and mathematics) fields and data science and to provide them with the opportunity to learn about the field and to network. Question 5: What should we expect for the course on the 31st? I don’t want to bore people with technical details but I try to introduce AI from the perspective of industries so they can understand AI, what solutions are available, how you can use AI in your own sector and what can be done with AI. you’ll learn about the state of the art in the field, and it will give you a much clearer perspective to understand if your industry and your company is ready for AI. I’ll also be introducing a hands-on tutorial that is accessible to non-tech savvy people to show that AI can be accessible even if you don’t have a tech guru on your team.